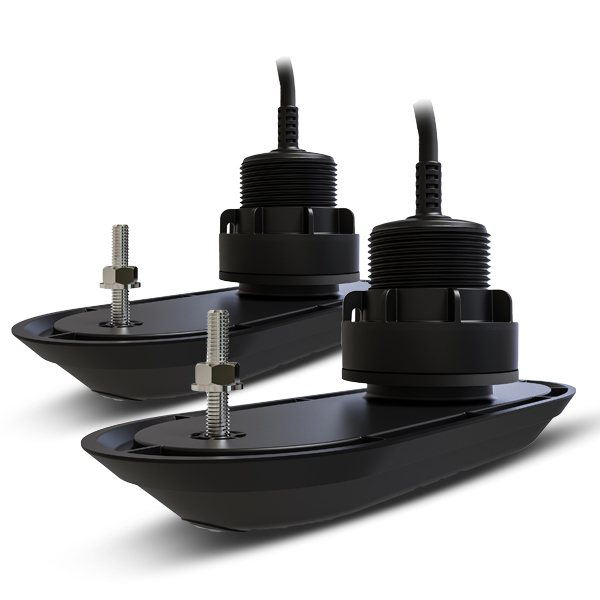 Designed for inboard or outboard boats, the RV-320 Plastic Through Hull Transducer System lets you easily identify structures and locate fish with the life-like clarity of RealVision 3D™ sonar. The RV-320 system is a 4-channel, Wide Spectrum CHIRP transducer system with DownVision™, SideVision™, high frequency CHIRP fish targeting and RealVision 3D™ sonar inside. The transducer system has a built-in attitude and heading reference system (AHRS) that stabilizes the sonar imagery, automatically compensating for vessel motion. You’ll enjoy crystal-clear imagery in waves, swells, and while maneuvering. The RV-320 system also has a built-in fast response water temperature sensor for quick, accurate readings. Raymarine’s RV-320 Plastic Through Hull Transducer system pack contains a pair of RealVision 3D transducers with internal offset to accommodate hull deadrise angles from 13° to 20°. This completely eliminates the need for fairing blocks. The low-profile design slips effortlessly through the water without causing drag or cavitation. The near-flush RV-320 system works even works great on trailered boats.